If there ever is a Love-Hate relationship involving mushrooms this mushroom is the one that has it - as far as I am concerned. Click on the photo for another view. I love these. I love finding them. I love picking them. I love eating them. Finding them is usually accidental. It is usually when you are out and about looking for other varieties when these are found. Picking them is easy enough. But keeping them for a while after picking is a problem. I hate them because you can not count on them to be anywhere in particular at any given time. 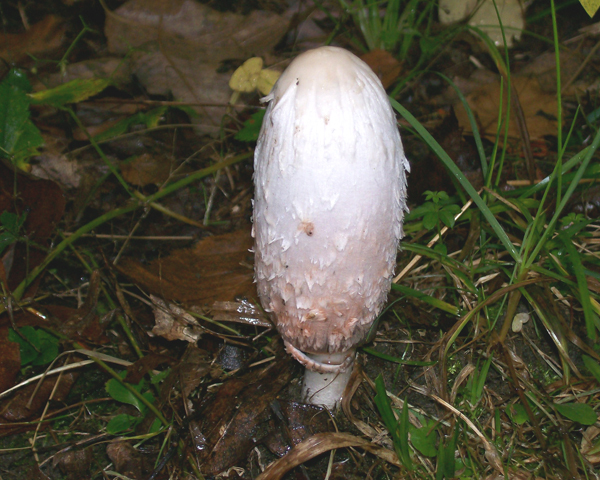 Even if the weather conditions are perfect - a nice cool rain for a few days in the Fall - you still can't plan on going on a Shaggy Mane foray can you? Oh, they are out there alright, somewhere, but try finding them. The other thing about these is when you find them there's usually a big bunch of them. You just have to get them all too. It is hard to leave any behind isn't it? 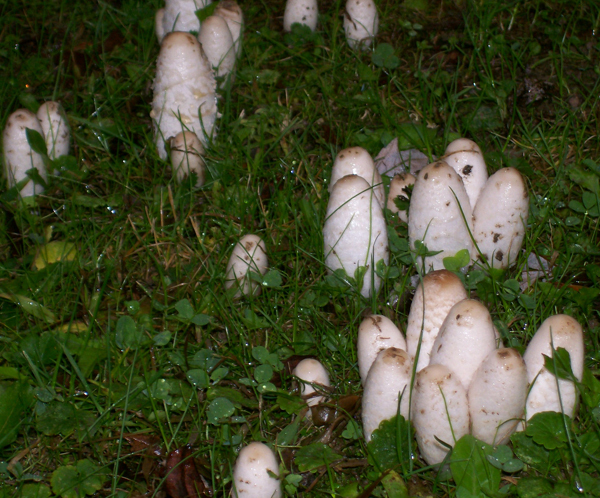 And the thing about Shaggy Manes is that you can't keep them sitting in your refrigerator for several days to eat at your leisure, or to wait a day or two to process them all for later use. You have to do it SOON. If you don't you will have a black mass in the bag / bowl /container. They auto-digest themselves and what is left is a inky looking mass - hence 'Inky Caps'. Here is one I am holding so you can get an idea of the sizes involved. They do get bigger however than the one I'm holding. I have found Shaggy Manes that stand stately a full 1 foot high. 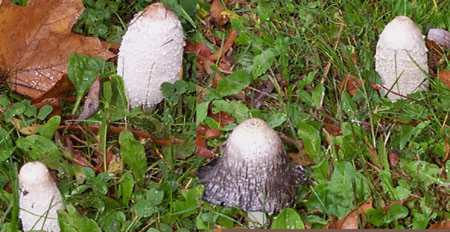 These are white to off-white to light gray / light brown mushrooms. Stature is conic, on the long / tall side. Long stalk. Bell shaped when a bit more mature. Gills white at first turning gray then black. The mushroom will start to get dark at the lower edges eventually turning all black. The cap has scales drooping down that give it the appearance of being one of those old style lawyers wigs. Grows in grassy areas and disturbed soil, such as newly renovated areas or gravel edges. Here is one that was all alone along a grassy gravel path from one woods patch to another. It is rare to find just one so knowing that I spent a lot of time looking around for the others that I expected to be popping. No luck though. So you are wondering, did I pick it or leave it? I PICKED IT! That's just the way I am when it comes to wild mushrooms. Best practice is to gather the best specimens from the group and leave the rest. However, another best practice is, if you are like me, to get as many good parts from the caps as can be salvaged ( check it out ) and collect all the stems you can ( check it out ). Like I said, I really like Shaggy Manes. 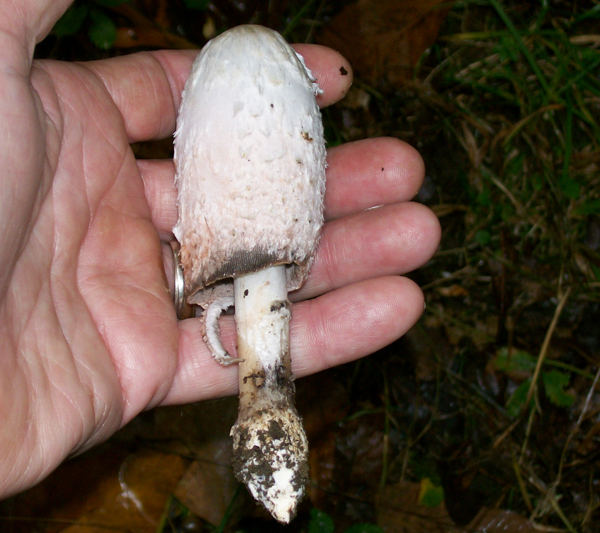 Coprinus comatus - A/K/A - Inky Cap, Lawyer's Wig. DATE - October 3, 2007 and September 30, 2009. FOUND - Blairsville, Pennsylvania and Laurel Hill State Park - near Bakersville, Pennsylvania. Several ( about 70 + ) were found on a newly seeded grassy embankment where an Industrial Park was being constructed. Another group, large group, was growing in the grass next to where trees had been planted and the dirt from filling the holes had been spread around. Weather conditions: Wet. On both occasions it had rained for several days - on and off and temperatures were in the 60's.